Saiterm Smarter Innovation | The lowest consumption ever. 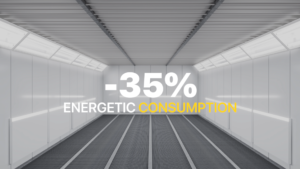 – 35 %.Less power consumption compared to traditional endothermic panels for bodywork, with the same performance and temperature. Thanks to the exclusive and patented innovations, the cost of processing is reduced further and drastically, due to significantly lower consumption. We have reduced consumption by 35%, compared to traditional endothermic panels available on the market.